It’s almost done, but it has been blocked - we need Microsoft (or UWP expert) support so we have a stable way to build UWP package for each release. I have managed to have a Notepad++ UWP package and have tested it in July 2017. However more work needed to be done in order to adapt Notepad++ to UWP package’s nature. Then I try on the 2 others PC with another application that I have managed to build - same result. The different results on same configuration with the same installers to build makes me deduct the conclusion: the source of problem comes from Windows Update. Please let me know if anyone has any idea for why and how ( my email is don.h@free.fr ). maybe this does the trick. The ink for downloading img in the link you provided is not available. oh, didn’t try the link and yes, seems that MS corrupted it. The base images can be downloaded from https://www.microsoft.com/en-us/download/details.aspx?id=56049. @donho What base image are you using to run the DesktopAppConverter? COMMENTAIRES : Minimum Windows Version requirement is met. COMMENTAIRES : Required feature is enabled. « C:\ProgramData\Microsoft\Windows\Images\BaseImage-15063\version.json », car il n'existe pas. BaseImage-15063.wim - which I’m trying to remove without success, as I described above. because of the WriteErrorException, did you run this as administrator? doesn’t this file exist? Then it looks like 15063 isn’t correctly installed. did you run this as administrator? Yes, the console was launched as administrator. I’m pretty sure they would love to see npp on the store. If you’re using build number 15063, and the minor version of that build is equal to or greater than .483 (For example: 15063.540), make sure to download the BaseImage-15063-UPDATE.wim file. If the minor version of that build is less than .483, download the BaseImage-15063.wim file. If you’ve already setup an incompatible version of this base file, you can fix it. This blog post explains how to do that. I did it! I have converted apps before, and did it fairly easily. My only concern is that the updater program might have to be removed, because updates come from Windows Store and an error would result if it tried to update itself (security reasons). I am running Build 16299 (Fall Creator’s Update) of Windows 10 Pro. Windows 10 Home does not work. I was running from a PowerShell with this directory, as administrator, and using the “Desktop App Converter” app from the Windows Store. @donho The DesktopAppConverter -Cleanup "All" -Verbose command, I would recommend trying as well. If you are having trouble removing a base image, try the command I just listed from @Claudia-Frank and see if it works. If you are having particular trouble, do how I did it using a Virtual Machine. You just download VMWare, and then a copy of the latest Windows from https://www.microsoft.com/en-us/software-download/windows10 as an ISO. Believe it or not, you don’t need to activate Windows to have this method work. Ideally, you would write a small script to run the Desktop App Converter command for you, because you might as well become good at running it (because you will run it every time you make a revision). Similar to .\build-appx.sh 7.0.0.0 or something simple. When you submit your app, you may need special permission from Microsoft for desktop app submissions. This is free, but you will need to fill out a form at: https://developer.microsoft.com/en-us/windows/projects/campaigns/desktop-bridge They will also help with the process if you need. Essentially, I would like to let you know something right now that I have discovered. The Desktop App Converter makes converting the basic app easy - sure. However, if you want to make really any modifications like changing the Display Name to support the ++ in the name, or you want to support opening .xml files (or any other file extension) from the “Open With” menu, it gets really complicated really quickly. Nonetheless, I have successfully packaged Notepad++ as appx. It will let you open any file (.xml or .php or whatever), and is signed with my personal certificate. If you want, I could put out instructions, but I warn you they were not easy to accomplish - took me a few hours experimentation, easily. You essentially have to take the package files, then modify the AppxManifest.xml file to support the file extensions you want, then generate a certificate on your computer (different from the ones -Sign makes), then make an Appx using MakeAppx.exe which is added to your System Environment Variables, then Package that AppX and sign it with signtool.exe. Not easy, but I did it. You might wonder, wasn’t it working before? It was, but you won’t be able to add extensible features to the package without the long list of complicated steps I just mentioned, for doing things like right-clicking an XML and seeing it under the "Open with " menu, or having a list of default-supported extensions. It will work, but many features that would greatly help out would be missing. You won’t be able to, say, double-click a file in File Explorer and have Notepad++ open it, for example. Desktop App Converter does only the basic stuff - it gets harder, quickly. If you like, perhaps I could just be the community packager for AppX files… I am here to answer any questions on request, and if you want an instruction guide I will write it. I am on fire today. Sorry for inundating your email boxes! This is not a pure Desktop App Converter build. Rather, I take the files Desktop App Converter creates, then modify them to support a few additional, crucial features. You can right-click any Notepad++ supported extension (except .cmd, .bat, and .hta) and find Notepad++ under the “Open With” menu, or set it as default. This is important because the conversion bridge does not support the old way of setting supported extensions (in fact, the whole File Extensions settings panel in Notepad++ doesn’t do anything with the UWP Bridge on). If this did not work, you could only open files from within Notepad++, and never from File Explorer. Added the “Edit with Notepad++” menu item when right-clicking items. 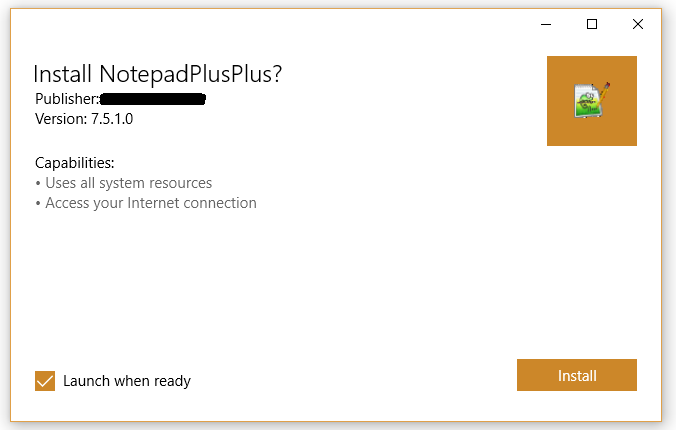 Unfortunately, due to the stronger security model on UWP Bridge apps, Notepad++ must have been set to default for that file extension already for the “Edit with Notepad++” menu item to appear. This makes it a little redundant, but I added it for backward-compatibility sake. (Hopefully) become a maintainer and submit APPX packages every time a new release comes out to @donho to manually upload to the Windows Store. @Alan-Kilborn No, it shouldn’t be. This takes the .exe file (already generated) that is currently used, and then packages it up. So you would have to make a regular installer anyway to use this method. Which, at that point, why stop supplying it if you are going to do it anyway?